Own a Rewarding Senior Care Franchise. Proven Model, Multiple Revenue Streams and Low Overhead make our opportunity one of the most attractive in franchise industry. Let Acti-Kare turn your dreams of small business ownership into reality! Call NOW for a FREE information package at 866-804-5934, or fill out the form above. Acti-Kare franchisees provide superior caregiving services to every member of the family. Franchise Owners manage a staff of caregivers that help our clients live a happier, more active life from the comfort of their own home. Now more than ever, seniors are choosing to remain in their own homes as they age instead of moving into a retirement center or nursing home. Due to the dramatic increase in Baby Boomers retiring, senior in-home care promises to become one of the fastest-growing industries around. Over 8,000 people turn 65 years old every day. Of those seniors, 90% stated that if given the choice, they would prefer to stay in the comfort of their own home as they age. The cost of the average assisted living facility is $40,000 – $55,000 a year, while having care provided at home is $18,000 – $22,000 annually. Comparing the two, it is easy to see why more and more seniors are staying at home. 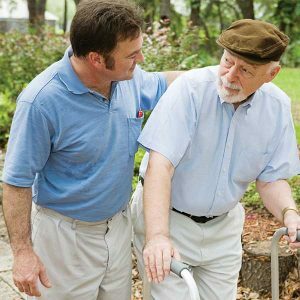 Our franchise owners primarily offer personal care and companion services to seniors living at home or at assisted living facilities. What makes Acti-Kare truly unique is that we offer additional services beyond Senior Care. One of our prominent services is a complete suite of non-medical home care services for mother and child care. These programs include caring for children and children with special needs, to our Mommy & Me and Mommy-To-Be programs, which help care for expectant mothers and postnatal care for mother and baby. We also offer Personal Injury Care and Recovery Care, caring for those recovering from an injury or surgery, as well as Pet Care. Low overhead. No office needed (in most cases). Complete advertising and marketing assistance. You will follow our step-by-step marketing plan and engage our preferred vendors to conduct all of your local advertising. We also provide complete assistance with getting your location registered to accept Medicaid, Veterans Administration funding, Long-term care insurance and Medi-care. Comprehensive Caregiver Training Program (no cost to the franchise owner or caregiver). Our proprietary online training and certification program ensures your caregivers are thoroughly trained as well as ongoing training. Our Call Center, Your Competitive Advantage…..
Our staffed call center that answers all inbound calls from potential clients/caregivers and “sets appointments” for client consultations. This service is available 9AM-9PM M-F and 9AM-5PM SAT/SUN. The call center also makes outbound calls to website inquiries or leads from third-party lead generators to set appointments for franchise owners. Representatives call these leads within 5 minutes of receiving them. The outbound hours are the same as Inbound. Call center reps also act as chat operators on the franchisee’s individual website during business hours. For a small fee, training may be arranged at your location. Franchises have a toll free number to call anytime for ongoing support from our franchise support team to help you along the road to your Aci-Kare success and so much more. Now is The Perfect Time to Join Us! Our proven processes, expert marketing, in-depth training and superior franchise support will help you build your own successful business, one you can be proud of.